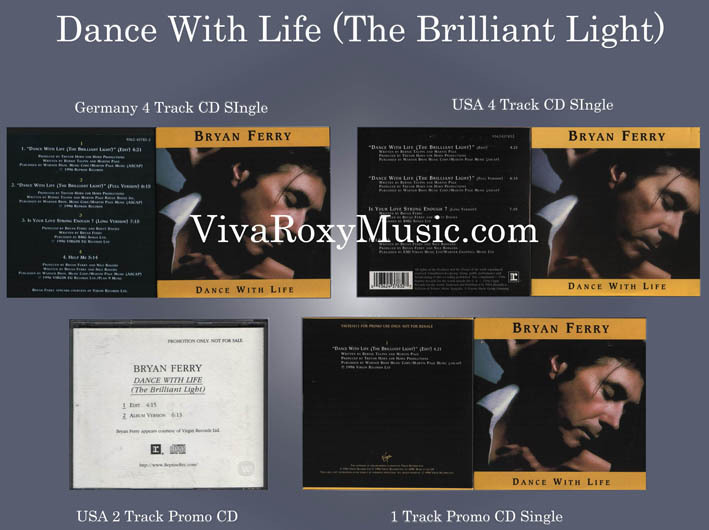 Lyrics to the song Dance With Life (The Brilliant Light) as recorded by Bryan Ferry. This song was written for Bryan for the soundtrack to the film Phenomenon starring John Travolta. Intended as a single release in UK but was withdrawn. Some one track promos of the edited version exist for this single release. A two track edit & full version promo was available in USA and in Germany & Australia the official release contained the edit version and the full version and also contained Is Your Love Strong Enough? Full Version (on CD for the first time) and a previously unreleased full version of Help Me. The song can be heard at the end of the film at the closing credits. The sleeve is a still from the promo video for the song. Bryan Ferry Vocals (Other musicians not specified on this song). Released in Germany & Australia.